Hey! I’m Adrienne. It’s nice to e-meet you! How do you really know who you’re buying from online? There are thousands of faceless e-shops out there and it makes me soooo nervous when I’m shopping online. I figured you might feel the same, so I thought I’d introduce myself so you’d at least know who I am and how I started my biz. Would you shop from someone who is insecure and unpopular? 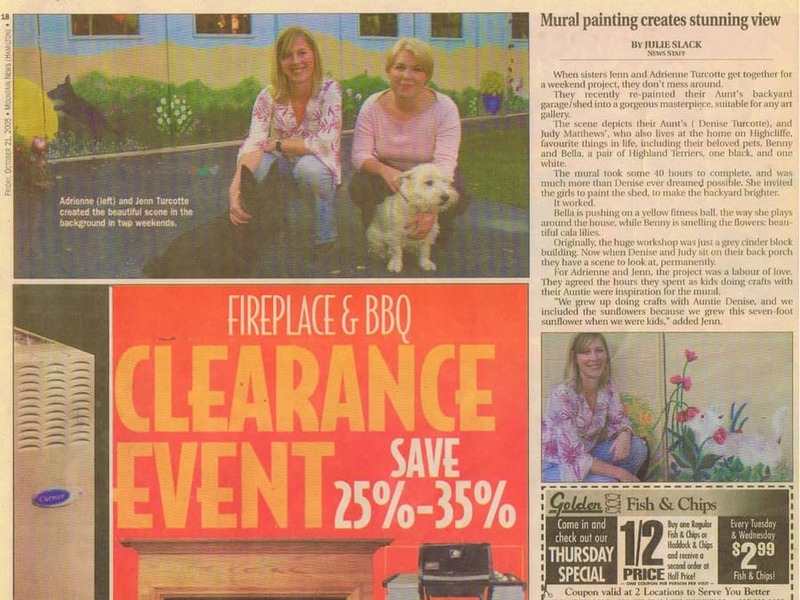 When people ask how I started painting wall murals (and eventually selling wallpaper murals), I used to give a canned answer about being featured in the newspaper – wayyyy back in 2005 – after painting a mural for my aunts. …I used to hide away in my high school’s Art Club because I was introverted, insecure and didn’t feel like I fit in. That’s where I learned to paint murals. It was the ONE thing I always felt confident at. But how could I start a business when I jumped from job to job through my twenties? I painted wall murals throughout my twenties as a part-time hobby business, but I NEVER thought I could turn it into anything more serious. In fact, I jumped from one job to another until my early thirties. Marketing, admin, bookkeeping…I was even a travel agent! At six-months pregnant, the travel agency I worked for closed down and I was out of work. Being scared was an understatement. But it was the best thing to ever happen to me. After having Audrey and settling into the groove of being a new mom, I needed something else to call my own. Something creative, challenging and…grown-up (I’m sure all you moms know what I mean). Audrey started daycare one day a week and I started my journey into building a business. Who do you think you are? It doesn’t matter…your baby will change that. At first, I still thought of myself as a part-timer. Small beans. No biggy. But something changed in me as Audrey continued to grow. And for the better. Work with like-minded clients (other mamas who love rolling up their DIY sleeves to make a stunning room, live a “green” lifestyle and demand value for their dollar). Be a strong role model for my daughter. Make people’s houses feel like a home to them…and do it every day. So I started looking at my business as a full time gig. Oh the stories I have of being a mompreneur. The first mural I painted after having Audrey, I forgot my pump. Um…can you say embarrassing AND painful? …was a 3-hour drive home at midnight in the middle of winter after painting for 10 hours. I realized that night that if I continued hand-painting murals, I wasn’t doing anybody any favours. Why? I could only help clients who lived within a certain distance of me. I’ve had requests from as far away as Quebec, but I had to say no. Audrey was missing me at night because I had to stay and finish painting or have another commute to my long-distance clients the next day. The long hours were sucking the creativity right out of me, making me miserable. I had the idea to sell wallpaper murals that could ship (for free!) all over North America. 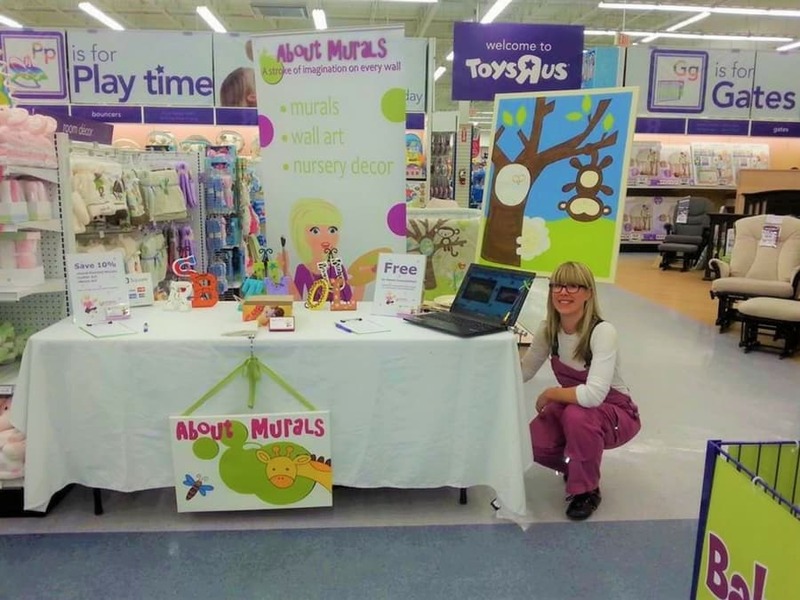 Although most of my business is designing and selling wallpaper murals now, I still love hand-painting kids wall murals for clients – but only those close to the Hamilton area, where I live. In fact, I was lucky enough to paint a mural for the Mike Holmes group that aired on the DIY network in April 2018. 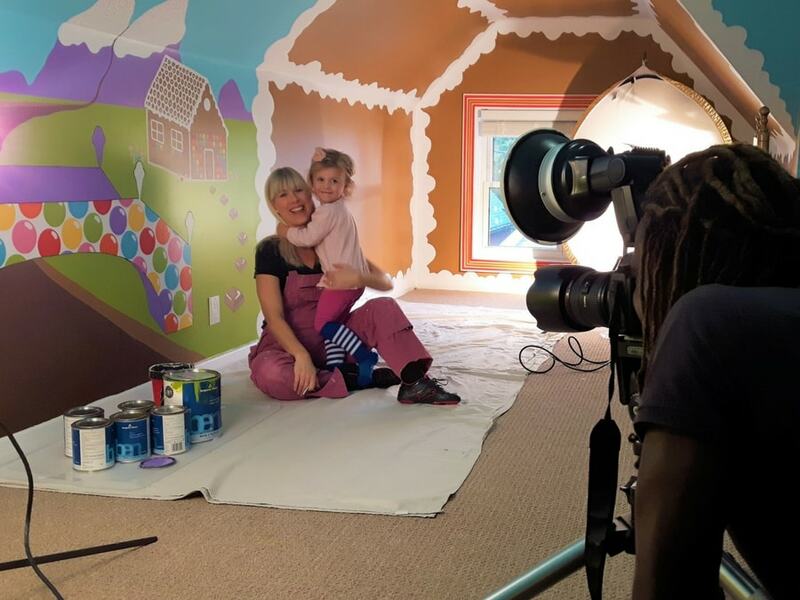 Oh, and Audrey’s playroom mural was featured in an advertising campaign for Bullfrog Insurance. I hope I’ve given you some insight into who I am and what my business stands for. If you’re planning on decorating your walls – and you feel comfortable shopping from me – I guess the next step would be to browse my wall murals to see if I have a design you like. If you made it all the way down here – wow! – thanks so much for reading my story! As a thank you, here’s a special offer just for you! If you have questions (or just wanna chat), get in touch. If you want some inspiration, you can follow me on Facebook, Instagram or Pinterest.